Nuoro: Shortly after midnight on New Year’s Eve, a vice-commissioner and a marshal of the carabinieri are injured by gunshots outside of the Nuoro prison. The action is claimed with a telephone call to the Nuoro daily paper on January 12th by the “Armed Nuclei of Combatants for Communism”. Trento: A crude bomb explodes early in the morning outside a club of the PCI, burning the front door of the office. The action is claimed by the “Proletarian Patrols” in a telephone call to a local daily. Padua: Bomb attack against MSI offices in the Arcella neighborhood. Rome: A Molotov is tossed against the San Paolo offices of the PCI. Minor damage. Cassino: Carabinieri major and head of security for Fiat Cassino, Carmine De Rosa is shot dead by two unmasked youths at 8 in the morning while sitting behind the wheel of his car. At the same time Giuseppe Porta also a retired carabinieri officer, responsible for security in the center-south for Fiat is wounded by machine gun fire. The action is claimed by “Armed Workers for Communism”(A signature of the FCC). On the morning of the 5th leaflets signed “Armed Struggle for Communism” are found distributed at the Fiat plant. Naples: The Criminal Division of the Naples Tribunal sentences four young militants of Front Line (Rosario Carpentieri, Stefano Milanesi, Raffaele Pingi and Loredana Biancarnano) to four years of imprisonment each. On the 17th of December 1977, the four had allegedly been responsible for organizing attacks during the sentencing for the defendants in the Naples trial against the NAP. Padua: Eleven attacks within a few hours against offices of the DC and carabinieri barracks. These attacks are claimed by the “Worker’s Organization for Communism” in protest against a 18 month sentence handed down by the court of Padua the day before against two young autonomist women. These types of action, like the ones in Trento on the 2nd of January and others, while not attributable for certain, seem to be the responsibility of militants within the area of Autonomy unaffiliated to the major armed organizations. Rome: An arson attack seriously damages the Ina Gallery on Via Tritone. Shortly after, two bombs explode at a municipal health facility and a DC office. Rome: A commando of youths outside the Acca Larentia offices of the MSI, open fire killing two MSI militants and seriously wounding a third. The commando flees the scene. Franco Bigonzetti, 19, and Francesco Ciavatta, 20 are killed. The action is claimed by the “Armed Nuclei for Territorial Counter-Power” in a statement to the media. Rome: During serious disturbances occurring in response to the Acca Larentia ambush, MSI militant Stefano Recchioni suffers a head injury caused by an exploding police projectile. He dies two days later. Trento: Clashes with a group of autonomists at a rally of German MSI supporters. Bari: The entryways of two MSI offices, in Terlizzi and Palo del Colle are set on fire and destroyed. Rome: Wave of fascist violence in response to the Larentia killings. In Rome two fascists on a motorcycle open fire on the assistant manager of Messaggero, Felice La Rocca wounding him. A young militant of Lotta Continua is severely beaten. Several dozen fascists systematically vandalize cars in the Toscolano neighborhood. Neighborhood offices of the PSI and PSDI are attacked and damaged. In the evening, numerous storefronts are smashed and looted. Naples: A large group of fascists raid and trash the Teatro San Ferdinando, firearms are discharged. Trieste: Two leftist youth are attacked and brutally beaten by fascists. Terni: Fascists set a PCI office on fire during the night. Major damages. Bologna: Arson attacks on a anarchist office, an office of Proletarian Democracy and a PCI office. Cagliari: Fascist arson of a PCI office. Trieste: Some Molotovs and a stick of dynamite seriously damage the provincial headquarters of the DC. Firenze: A Molotov cocktail is thrown at a DC office. Reggio Calabria: Arson attack on an HQ of the fascist union CISNAL. Bari: Arson attacks on the homes of two supporters of the DC. Milan: The home of a foreman at the OM factory is damaged in an attack. The attack is claimed by a group of the extreme left. Bergamo: A commando of five torches the warehouse of the Commissionaria italiana trasporti in Zingonia. Damages are around two billion lire. The action is claimed by the “Armed Worker’s Squad” with a leaflet placed in the bag of one of the employees. On the same day an unclaimed arson attack seriously damages a PCI office in Treviglio. Turin: Manager at Mirafiori, Gustavo Ghirotto wounded by gunshot in an attack by a commando of the BR. It seems that the BR intended to strike his twin brother Giancarlo, an executive at Fiat Rivalta, because in the claim of responsibility to ANSA he is identified by the BR as a “boss of Fiat Rivalta”. Sassari: The car of a DC trade unionist is destroyed following an attack. Rome: Raffaele De Rosa, central director of the commercial line SIP, is shot in the legs in the lobby of his apartment building while on his way to work. The BR claims the action in a telephone call to Ansa. Rome: Two militants of Lotta Continua, putting up posters are attacked by a group of fascists armed with iron bars and knives. Milan: Enzo Fontano accused of the murder of a brigadier and participation in a armed gang (the BR) is not present for the second hearing of his trial. On the 19th he will be sentenced to twenty four years for the murder of the brigadier Lino Ghedini and four years for participation in an armed gang. The other two defendants, however are acquitted. Cagliari: During a union demonstration numerous Rumanica workers carry out acts of vandalism and damage the factory. Rome: An explosive device made from TNT destroys a clothing store on Via Jenner. The attack is claimed in a telephone call to a daily paper by the “Combatant Communist Nuclei” which alleges the clothing store is a “center for the fascist squads”. For most attacks in this period it is impossible to establish if they have been carried out by the major armed organizations or by militants of the area of autonomy, formed into groups to carry out one or two limited actions, signed as “combatant group” or “armed nuclei”..in imitation of the BR. Rome: Preventative arrest warrants are issued from the “prevention section” of the Rome tribunal. The measure of the judiciary is the first judicial procedure carried out in order to implement the Reale law on coerced residence. Ruggero De Luca and Marcello Blasi are effectively arrested. Riccardo Tavani, Graziella Bastelli, Daniele Pifano, Bruno Papale, Vittoria Papale, Massimo Pieri, Raffaele Bruno and Roberto Mander are targeted by arrest warrants but there whereabouts remain unknown. Rome: Beginning of the first hearing of the trial against members of the “Collettivo Policlinico”. Genoa: A commando of four militants enters the office of Filippo Peschiera university professor and leader of the DC current “Forze Nuove” in the city. After a attaching a placard with the five pointed star symbol of the BR to his back they begin a trial. At its conclusion he is shot in the legs. Milan: A bomb is found in the room where hearings will be held in the trial of members of fascist group Ordine Nuovo. The bomb does not explode due to a technical defect. Padua: A national investigation of Autonomia is proposed by Pietro Caligero, Padua Deputy Prosecutor of Padua to investigating magistrate Giovanni Palombarini. Caligero requests criminal conspiracy charges against the leading groups of Worker’s Autonomy in Padua, the dimensions of which extend to Padua and all the locations in Italy where groupings of Worker’s Autonomy operate. Rome: Clashes between police and militants of the extra-parliamentary left attempting to block a rally of MSI militants. Firenze: An armed commando of two men and one women, enter a house next to the entrance of the prison, in an attempt to facilitate the escape of some detainees, among them, Renato Bandoli a student arrested in April 77’ in an apartment in which materials of the “Combatant Communist Union” were found and suspected of link with the anarchist guerrilla “Revolutionary Action”. Three police arrive on the scene by chance and clash with two other members of the commando. In the gun battle, one officer is killed and another wounded. The five member team is able to escape. Bologna: Serious clashes between militants of the far left and police during a protest against the trials for the events of March 77’. Journalist Romano Zanarini is wounded. Serious damage to shops. Rome: Three Molotovs thrown against an MSI office. Minor damage. Rome: Arrest warrants and residential detention for two militants of Worker’s Autonomy, Massimo Pieri and Vittoria Papale. The two are at large. Rome: Around ten thousand people participate in a rally against repressive measures towards Worker’s Autonomy. Milan: Union-management agreement in the Unidal dispute. 5855 employees rehired in the same company. 1392 in others. 1170 to be laid-off. Rome: The office of attorney Fausto Tarsitano, PCI member is torched. Serious damage. Bologna: Group of students occupy the headquarters of RAI in Bologna. They want to read a communique demanding the resolution of the judicial proceedings on the events of March 77’ on TG1 and TG2. Rome: CGIL secretary Lama gives interview. He discusses the policy of self sacrifice and “prioritizing the problems of the unemployed”. He recognizes the “excesses” of workers at some firms and discusses revising the mechanism for handling redundancies. Turin: Arrest of two Fiat workers for a failed attack on a carabinieri barracks on the 18th. The police suspect them of membership in a group associated with Front Line. Milan: Nicola Toma manager in charge of public relations for Sit-Siemens is wounded in a morning shooting on his way to work. The action is claimed by the BR in a call to Ansa. Rome: Press conference of Autonomia at the HQ of the via dei Volsci collective against the repressive measures. Genoa: Thirteen young members of the area of autonomy are detained in a police operation which results in the seizure of a quantity of BR fliers on the Peschiera action. The thirteen are accused of “condoning crime and participating in an armed gang”. A leaflet issued by autonomists condemns “police provocation”. The thirteen are released on the 31st due to insufficient evidence. Milan: Bomb attack on a carabinieri barracks. An exterior wall and the archive room is destroyed. The action is claimed by the “Armed Communist Nuclei” in a telephone call to the press. Rome: Eight trucks of the logistics firm Acotral are destroyed in an arson attack. Milan: A bomb attack damages the DC headquarters on Via Fermi. The action is claimed by “Women in Struggle for Communism”. Milan: Fascists molotov an occupied space on Corso Sempione. Sarzana: Bomb attack damages the entryway of a PCI office. Rome: The car of attorney Nicola Lombardi, regional councilor of the PCI is destroyed in an arson attack. Lombardi had recently carried out with Fausto Tarsitano a series of initiatives of the provincial federation of the PCI against “armed extremism”. The action is claimed in a leaflet by the “Combatant Territorial Nuclei”. Maccarese: The offices of the municipal delegation are destroyed in an arson attack. Ogliastro: Molotov attack on the local carabinieri barracks. Monza: Incidents occur when left militants disrupt a DC rally. Moiano: Eight powerful explosive charges seriously damage a new prison under construction. Naples: Three offices of the DC are seriously damaged by arson attacks. Bologna: Clashes between police and extra-parliamentary left militants. Some cars are torched. Rome: Clashes with police at student walk out against political repression. Seven police and two civilians are injured. Milan: Armando Girotto the owner of a small print shop is shot in the legs by a commando in his office around eight in the evening. The action is claimed in a telephone call to the media by the “Armed Worker’s Group”. 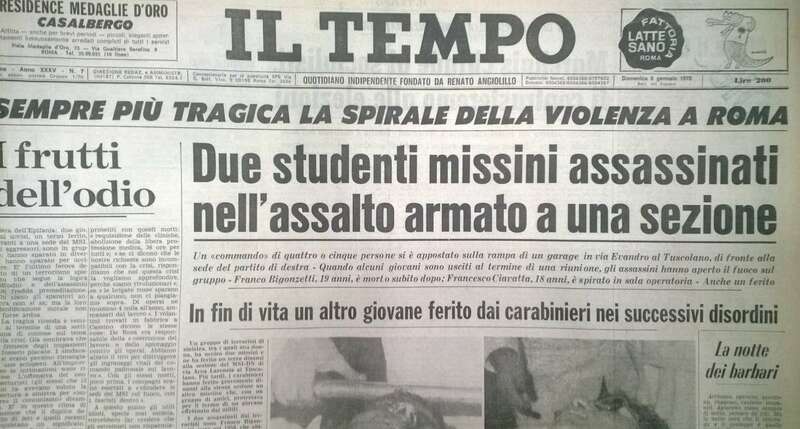 The communique states “We have crippled Armando Girotto who seriously injured a unionist in 1973.” In 1973 Girotto had opened fire on a union delegation during a strike. Rome: Luigi Rosetti, Roman leader of the Communist Committees and former PO militant is arrested by personal from the Political Division of the police. He is charged with “formation of an armed gang”. Leaflets and notebooks related to recent actions are seized from his apartment.